Explore a science museum that’s not just for kids! Experience the intersection of history, science, art and architecture at the Science Mill in Johnson City! The Science Mill now offers guided, adults-only tours of the museum and its amazing exhibits. · Get a glimpse into the history of the Science Mill, housed in an 1880 cotton mill. 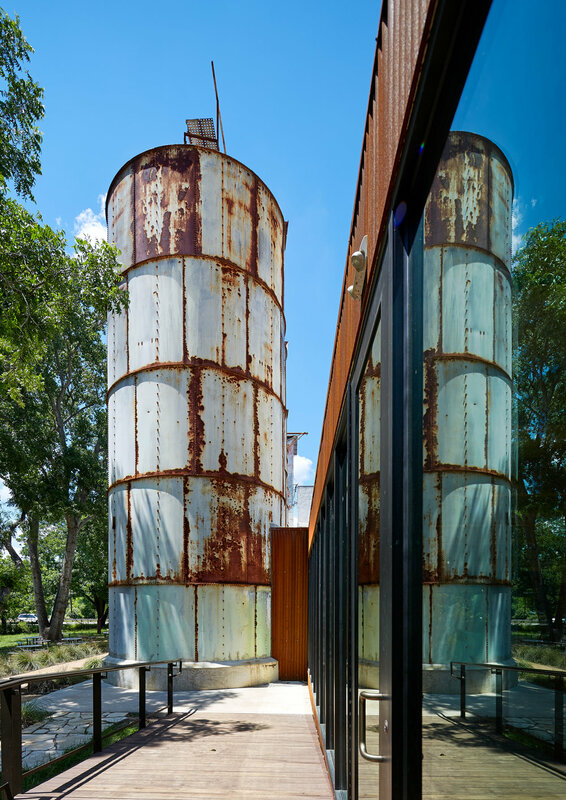 · Explore the museum’s unique architecture blending old and new, including the 40-foot grain silos now housing interactive science exhibits. · See Johnson City as it was years ago in our “A Mill in Time” photo exhibition. · Discover unique pieces of art created by local artists especially for the Mill, including exhibits, paintings, murals, sculptures, video displays and installations. · Watch a short 3D science movie. o Wave Pendulum—Twelve silver steel balls hanging at increasing lengths are suspended 30 feet in the air. You control them with a push of the button and watch the laws of physics to artfully play out. o Silo of McKays—Created by Wimberley artist McKay Otto, this contemplative art installation that combines light and sound in a space for meditation and reflection. o The Story of Water—Enter the underground world of aquifers and explore the movement of water through caves and crevices in this exhibit. o Fractalarium—Combining mathematics, art and biology, this colorful large-scale model that demonstrates how fractals—or repeating patterns—occur in nature. o Bio Lab—Meet the axolotls, endangered salamanders that can regenerate their limbs and organs, use your cell phone as a microscope, pump air into a real pig’s lung and more! o Paludarium—Observe tropical flora and fauna in an enclosed natural habitat. The nonprofit Science Mill, which opened in 2015, is a wonderful place for all ages to explore and learn. It is located in the heart of Johnson City and is adjacent to the Lyndon B. Johnson National Historic Park. $15 per person (includes admission, tour and 3D movie). Minimum group size of 10 people. If you are interested in scheduling a private tour for your group, please contact us. Email info@sciencemill.org or call 844.263.6405 to make a reservation.